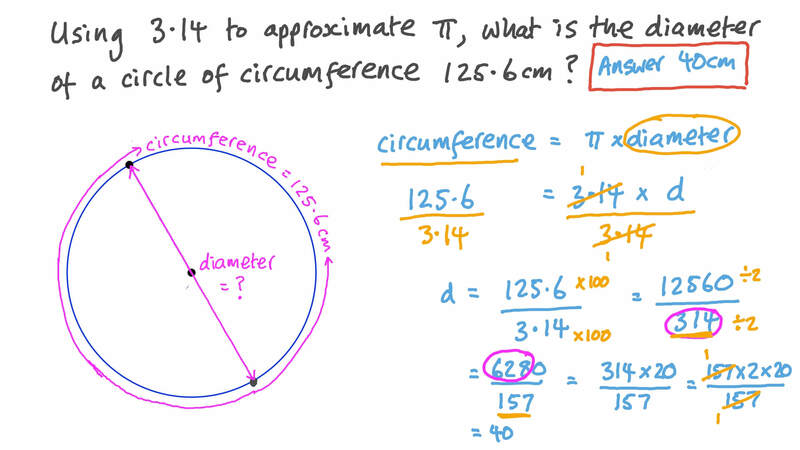 In this lesson, we will learn how to find the circumference of a circle using the formula 2πr. Work out the circumference of the circle given that 𝑂 𝐴 = 5 , giving your answer accurate to two decimal places. 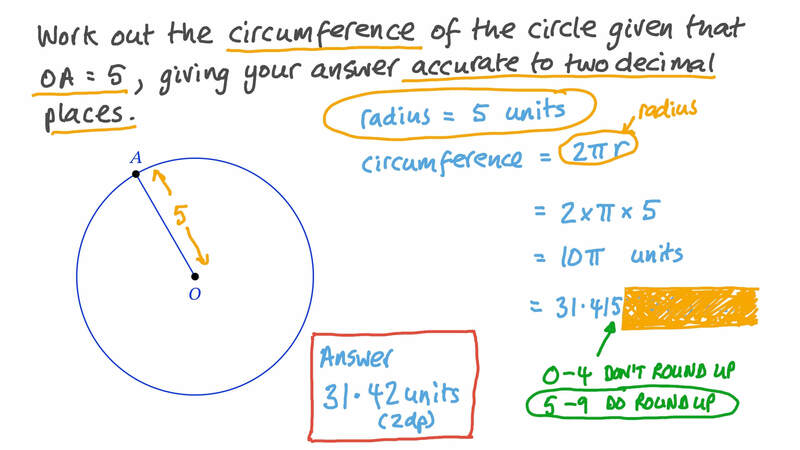 Work out the circumference of the circle, giving your answer accurate to two decimal places. Using 3.14 to approximate 𝜋 , what is the diameter of a circle of circumference 125.6 cm? Using 3.14 to approximate 𝜋 and the fact that 𝐴 𝐵 𝐶 𝐷 is a square, calculate the perimeter of the shaded part. The circumference of a circle is a function of its diameter 𝑑 represented by the equation 𝑐 = 𝜋 × 𝑑 . If the diameter is the input and the circumference is the output, calculate the circumference when the diameter is 5. Write this ratio in its simplest form: The ratio of the circumference of a circle to its radius. If the radius of a circle equals 13.8 cm, find the length of its longest chord. Find the circumference of a circle whose radius is 12.4 cm. Give your answer to the nearest centimetre. Using 2 2 7 to approximate 𝜋 , what is the difference in circumference between a circle of radius 77 cm and one of radius 63 cm? Using 2 2 7 to approximate 𝜋 , what is the difference in circumference between a circle of diameter 63 cm and one of diameter 49 cm? Using 3.14 to approximate 𝜋 , what is the difference in circumference between a circle of diameter 100 cm and one of radius 15 cm? The two circles shown in the diagram are concentric. Work out the circumference of the larger circle, giving your answer in terms of 𝜋 . What is the radius of a circle with circumference 7 8 𝜋 cm? Using 3.14 to approximate 𝜋 , determine the number of turns that a wheel of diameter 55 cm makes in rolling a distance of 345.4 cm. Determine the perimeter of the figure, using 3.14 to approximate 𝜋 . Use 3.14 to approximate 𝜋 and calculate the circumference of the circle. What is the formula for the circumference of a circle with radius 𝑟 ? Work out the circumference of a circle with a diameter of 10 inches, giving your answer to two decimal places. The formula for the circumference of a circle is 𝐶 = 2 𝜋 𝑟 . 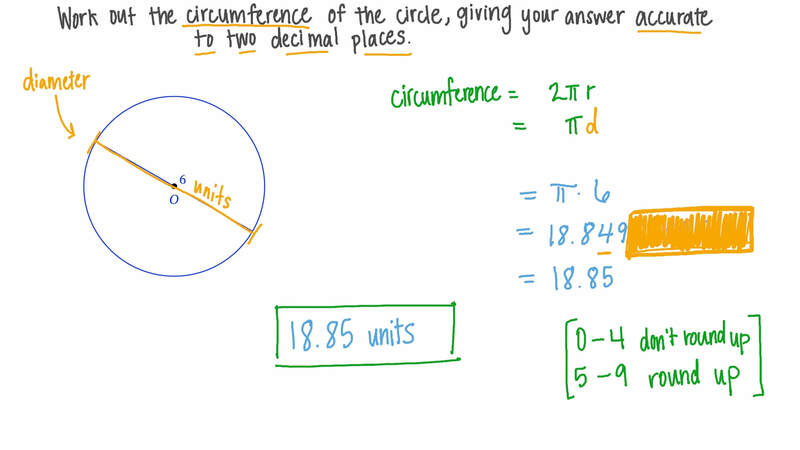 Find the circumference of a circle with a diameter of 12 in. Give your answer in terms of 𝜋 , knowing that the diameter is equal to 2 𝑟 . The formula for the circumference of a circle is 𝐶 = 2 𝜋 𝑟 . Rearrange this formula to make 𝜋 the subject. Find, to the nearest hundredth, the circumference of a circle of diameter 55.5 cm. The length of the longest chord in a circle is 40.3 cm. Find its circumference. You may approximate 𝜋 by 3.14.